We sell A. Vogel (Bioforce) products like A. Vogel Menoforce® Sage 30 Tablets - for the menopause online in the UK and directly from our award-winning store in Scotland. Menoforce® is a traditional herbal medicinal product used for the relief of excessive sweating associated with menopausal hot flushes, including night sweats. Extracts of sage herb, such as Menoforce® Sage tablets, have become one of the most popular menopause treatments, gaining a reputation as a simple way of helping deal with excessive sweating, hot flushes and night sweats during the menopause. We sell real A. Vogel (Bioforce) and other Female Health directly from our shop in Scotland and online throughout the UK. View more products from A. Vogel (Bioforce). Where can you buy real Menoforce 30 tablets safely online? If you are wondering where you can buy A. Vogel Menoforce® Sage 30 Tablets - for the menopause safely online in the UK, then shop with us. We are an actual health foods shop; with real people selling real foods and products. Our award-winning independent shop is located in Stirling, Scotland since 1976. You can buy our Female Health in store or safely place an order with us online or over the phone. 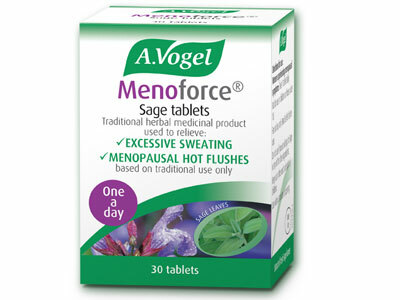 Menoforce 30 tablets - A. Vogel Menoforce® Sage 30 Tablets - for the menopause in Female Health and Herbal Remedies, Tinctures & Supplements.